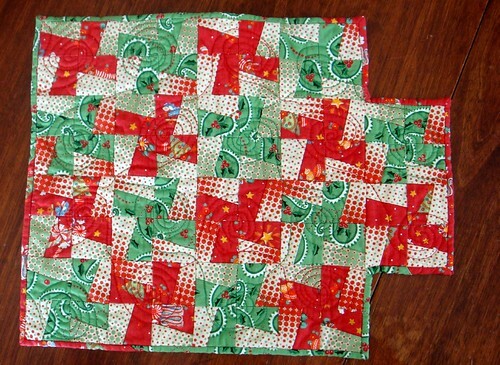 I was thrilled to receive a package in the mail the other day and find this lovely doll quilt tucked inside. The little quilt was created by Lori and it's just precious, and couldn't have been a more appropriate quilt to arrive the week of Christmas. 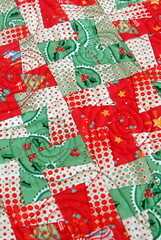 I love the swirly quilting, the bright colors, and the festive design. Thank you Lori! I hope everyone had as terrific a Christmas as we did. We had Christmas dinner on Tuesday night with my brother, sister, their families, and my parents so today was all about opening gifts, spending time together, and playing, playing, playing. I still have some gift sewing to do. I let my girls, my niece, and my sister "shop" my fabric stash and tell me what they wanted me to sew for them and from what ... so now I get to start sewing for them. I'm excited to see what the results of their choices will be ... 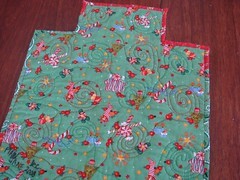 I just have to convince R. to give me a little time at the sewing machine!